Through the business concept Jyske Differences, Jyske Bank has created an internationally mould-breaking concept. Hear Frank Pedersen tell about the results, the innovation process and the thoughts behind the concept. 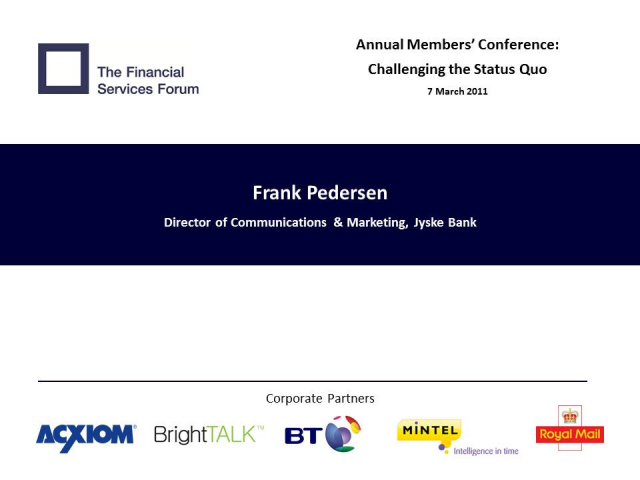 Frank has been a key driver in many of the change processes Jyske Bank has implemented in recent years. Before this he worked as an adviser on IPO’s and mergers and acquisitions. Jyske Bank has 4000 employees and is the 3rd largest Danish bank.